PM Netanyahu speaks with Argentine President following cancellation of friendly soccer game in Jerusalem. Prime Minister Binyamin Netanyahu spoke on Tuesday evening with Argentine President Mauricio Macri following the cancellation of the friendly soccer match between the two countries’ teams. 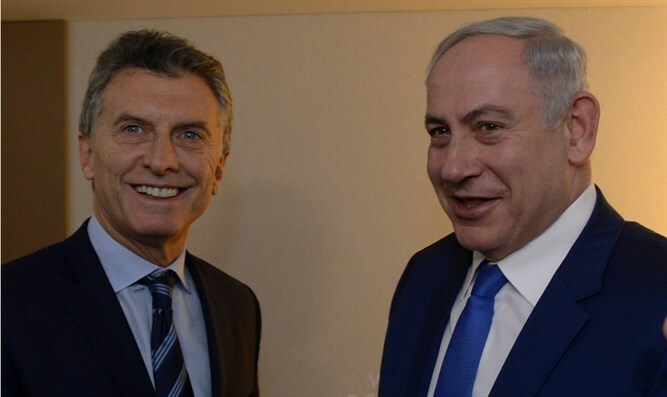 However, officials in the Prime Minister's Office said that Macri informed Netanyahu that he has no influence on the decision whether or not to hold the game as scheduled. Earlier on Tuesday, Argentine media reported that the game, which was supposed to take place this Saturday at the Teddy Stadium in Jerusalem with the participation of Argentina star Lionel Messi, had been cancelled due to Palestinian Arab pressure. Some of the public pressure against the game came from Israel as well. Last Friday, MK Yousef Jabareen (Joint List) met the Argentinean ambassador to Israel and ask his country to reconsider the Argentina team's appearance in Jerusalem. "I stressed that the game, in the wake of the killing of the Palestinians in Gaza and the relocation of the U.S. embassy to Jerusalem, sends a dangerous message to the Israeli government that the world ignores its gross human rights violations. Messi cannot turn his back on the Palestinian victims," said Jabareen. Earlier this week, Palestinian Football Association chief Jibril Rajoub called on Messi not to play in the Argentina-Israel game in Jerusalem, urging fans to burn their shirts if he does.